Talk about being morally tone-deaf and unapologetically disinterested in the needs of those below your wealth status. This is the jacket America's First Lady wore to the detention center that is housing the children snatched from their parents. 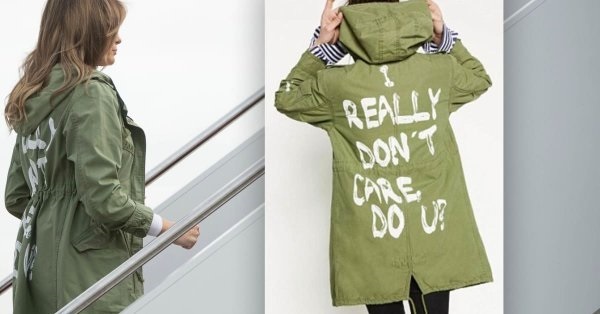 This so-called fashion statement by Melania Trump simply says all that needs to said about America's current state in terms of the moral high ground. It verifies that this nation has slipped off that moral cliff into absolute moral bankruptcy. I don't even think an election can change the current course of America. We are seemingly on a one road track to humanity's destruction. All those in power care about is the continued whitening of America. They also have no concept, nor need, of a truly colorblind society; they have never wanted nor will they ever seek that model nation in the valley of hope's democracy.